Unwanted guests in the banquet you've created to grow a lush lawn can be frustrating. When weeds pop their unwanted presence out from the carpet of your green lawn or in the cracks of your walkway, douse those bad boys in a homemade weed killer. A homemade weed killer doesn't hold the same harsh chemicals of commercial products but can often be just as effective when used correctly. Making a natural herbicide is part of a growing trend for greener living. Using products that don't add to the destruction of the environment through harsh, manmade commercial chemicals can assist in living that more eco-friendly living trend. It's a movement that is growing in gardens across the country. More commercial products are also attempting to go green, although they can be quite a bit more expensive than creating your own concoction that is effective and natural. 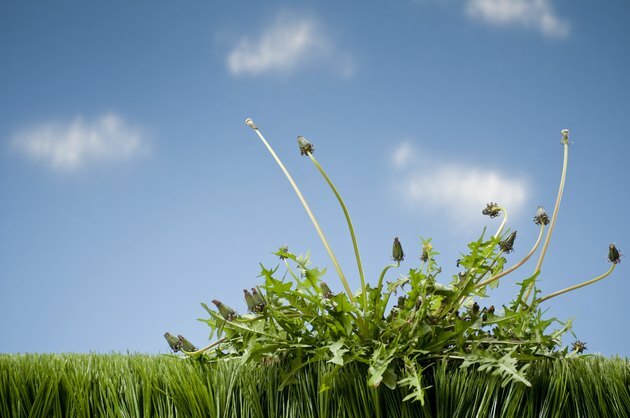 Commercial weed killers attack the weeds at the root and can be fast-acting and long-lasting. Homemade weed killer uses household agents, from rubbing alcohol to lemon and vinegar, to struggle the plant at the surface. There are many ways to make a homemade concoction to strangle the growth of weeds without eliminating the good growth happening in a well-maintained lawn lush with the results of your ongoing efforts. Choosing plants that are disease resistant can also help in cutting down the need for chemical herbicides in the garden. You can pull weeds by hand, but that is labor intensive and time-consuming. A gentle weed killer of vinegar, salt and liquid dish soap can eradicate unwanted garden guests that grow seemingly overnight. Use 1 cup of vinegar to a teaspoon of salt and a few drops of liquid dish soap. The dish soap acts as a surfactant for the acetic acid in the vinegar and the abrasive salt to penetrate the fibrous leaves of the weed. The affected weeds should turn brown and whither within a few hours of having the homemade elixir applied. The treatment needs to be applied daily in order to reach the roots of the weeds. Pair your chosen homemade weed killer with a layer of mulch to cut back on the growth of weeds in flower beds and vegetable gardens. If you are truly desperate for a quick eradication of weeds, particularly on walkways or areas where healthy plants won't inadvertently be affected, you can douse the weeds in a strong solution of vinegar or rubbing alcohol and water.